The opportunities for pioneers in the student housing sector have never been greater, as record investment levels and surging student numbers over the past two years have resulted in student housing growing into a global asset class. According to the latest Savills World Student Housing Spotlight, investment into the global, purpose-built student accommodation market has seen rapid expansion, with the US investing $14.9 billion globally in 2015. Savills Student Accommodation Director Conal Newland said “student housing has proven itself to be a resilient asset class. As an emerging market for student accommodation, transactional activity is limited in Australia as assets are generally tightly held. Research indicates that there is more than AU$2 billion of capital earmarked for development projects in Australian student accommodation. Mr Newland said that the growth in higher education enrolment has underpinned demand for student accommodation. “During and shortly following the GFC the sector saw a boost to student numbers as the weaker job market pushed more people into higher education,” he said. 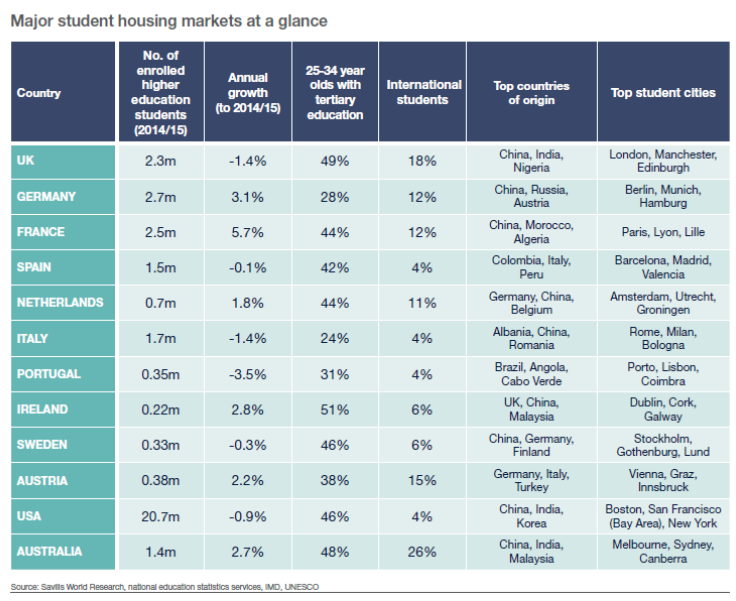 According to the latest Savills World Student Housing Spotlight between the 2006/2007 and 2010/11 academic years, student enrolment increased by an average 12% across the top seven internationally significant student markets. Australia enjoyed a very strong run with total numbers up 37% in the last eight years. “Australia is a popular destination for international students, particularly from Asia where China and India together supply nearly 40% of international students,” Mr Newland said. However, the numbers of students coming to Australia indicate that Australia’s supply of purpose built student housing is failing to meet demand. “The imbalance is acute, with only 7% of students accommodated in purpose-built student housing,” Mr Newland said. With approximately 67,700 beds of purpose-built student housing in the eight Australian capital cities, all cities have an existing supply of less than 12% per full-time student with the exception of Canberra (27.8%).